As the clock strikes twelve, thoughts of new beginnings buzz over in your mind 'New year, new me!' and all the other cliches that coincide. So, for the first week or so, you try to hold back from the choccies and do yoga every morning. However, you then remember the Christmas left overs (cheeses, biscuits and the like), how comfortable your bed is when you hit snooze and your other average Winter comforts. I personally also find myself over the 31 tedious days of January conjuring the resolutions that I should have made on Day 1. It was actually a post on Facebook that made me wonder; 'Can't we just start over on Febuary 1st?'. I pondered this idea for some time and came to the realisation that, really, January 1st is just another day and in fact you should be able make your wishes come true at any point during the year. Being limited to that crucial moment when Big Ben strikes 12 just leaves us with missed opportunities stored up in our Idea-Composing-Combibulator at the back of our brains. After all this hard turning of the rusty cogs some call a 'brain' I came up with the most original, ground-breaking idea known to man... A to-do list! 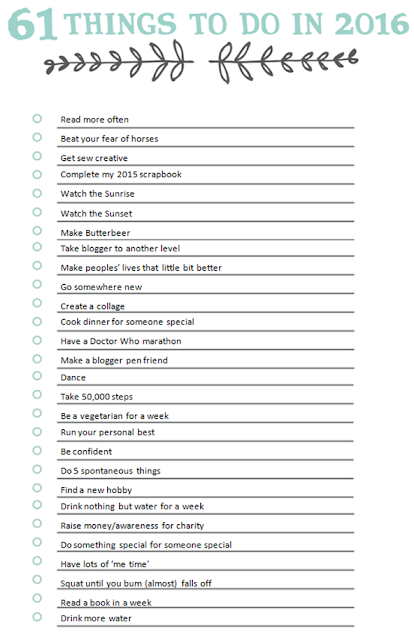 That's right, I decided that this year I will complete 61 things that I came up with over the first month of the year. Listed below are the said 61 things; they range from the deep and potentially life-changing to the completely insignificant to the rest of the planet. In my mind these 61 things are all achievable unlike the resolutions I would have made under the restraints of just 1-4 ideas. To be able to make an impact on your life I believe that it's the little things; making myself and, in some cases, others feel that little bit happier from a fun activity or maybe just trying something new, are example of this. I believe that the changes you desire to make are not, in reality, too far out of reach so small bursts of imagination are completely adequate for reaching your potential. Of course this doesn't mean to say that there may be some of you out there that think completely differently as this is based entirely on my opinion. Feel free to share yours in the comments below. What changes will you make this year? 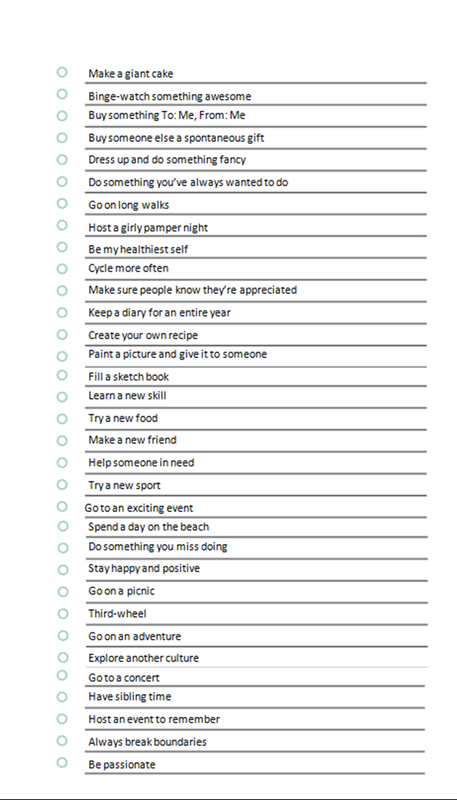 Have you got a to-do list? I am so interested to hear all about it!